For those of your wondering what the hack I’m on about, a hackathon (also known as a hack day, hackfest or codefest) is a design sprint-like event in which computer programmers and others involved in software development (e.g. hardware/software engineers, mechatronics, graphic designers, interface designers, project managers etc), collaborate intensively on software projects. The goal of a hackathon is to create a usable software or hardware product by the end of the event. 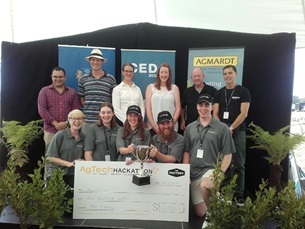 In this case, the Hackathon’s other aim was to connect New Zealand tech talent with our primary industries, solving the problems that were put forward in the form of challenges. 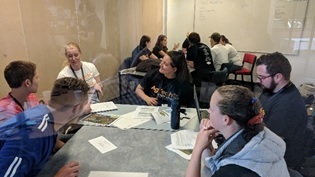 Zespri, LIC, Fonterra, and Gallagher joined PF Olsen in creating the five challenges which were then up to the teams to solve, before presenting their solutions to a team of judges and the public at the Central Districts Field Days. No pressure at all! Each challenge was supported by a mentor who guided the team, keeping them sane and on track, whilst also providing them with background details to the problems posed (think of mentors as a cross between a client and a parent). 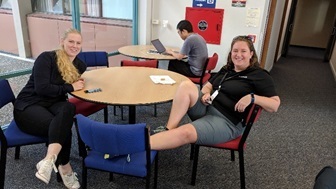 In addition, there were a range of other mentors available to the teams including mentors from Amazon, Massey University, Horizons Regional Council and the AWARE Group. PF Olsen sent along two challenge mentors (Kathryn Gordon and myself), which was just as well as between us we looked after two teams of five hackers. Our teams, the Lumberhacks and Aqualitics, were both charged with coming up with a solution to using technology to efficiently and accurately monitor and report on water quality. After a bit of brainstorming the Lumberhacks settled on creating a device that would measure a range of water quality variables that would then send the data through to a dashboard which would detail the waterways health. Team Aqualitics took an entirely different approach to the challenge. They chose to work on creating a “fish-al recognition” device that would sense when different fish species swam past and could identify them based on a range of parameters. They also had a dashboard for the product that kept track of the species identified and the number of each species. Judging by the number of other mentors offering the Aqualitics team help, Kat and I were not the only ones extremely excited by this concept (at one point there were more mentors in the room than participants). Day one wrapped up at 9pm with us literally throwing the participants out the door. While Kat and I headed back to the motel, we were very much aware that members of both of our teams were pulling all-nighters in an attempt to add a touch more polish to their products. Day two kicked off at 7:30 am, and it spoke volumes that all members of both of the PF Olsen teams were there raring to go, long before many of the other teams showed up. Everyone then had 2.5 hours to put the finishing touches on their devices, including coming up with their product pitch, logos, branding and anything else they wanted to create to impress the judges. By 10:30 am hacking was complete, and everyone was packed up and heading off to the Field Days. Once at the Field Days everyone had an hour to set up their stands, grab lunch and go for a wander. Once the judges arrived, every team had 5 minutes to impress the judges with their pitch and answer any questions. Members of the public were also allowed access to the tent, to see what the participants had created. By this point everyone was running on adrenaline alone, the caffeine from the coke, coffees and energy drinks having run out several hours ago. Both PF Olsen teams gave very slick pitches to the judges, ably answering questions, and supported by very professional looking posters and logos (not to mention the PF Olsen branded shirts and hats). And finally, the moment we’d all been waiting for – the prizes. Third place went to the Fonterra Team who used virtual reality to train/upskill farm workers and potentially attract new workers to farming. Second place went to one of the teams from Zespri who used digital technology (QR codes) to manage the optimal productivity of individual vines/bays within a Kiwifruit Orchard. And first place went to our Aqualitics team, who’s innovation, smooth and polished pitch, and catchy phrases well and truly paid off! Kat and I are incredibly proud of both of the PF Olsen teams. Putting aside the exhaustion factor, the Hackathon proved to be an extremely challenging event, and yet the focus, poise and communication skills displayed by both teams, and indeed all participants, was amazing and humbling to watch. As this was the first time PF Olsen had attended such an event, we had very limited expectations; we certainly weren’t expecting to come out of it with two functioning concepts and the win. All in all, a truly amazing event and well worth being a part of. Our thanks go Johnelle Hosking from The Factory for organising such a great event, Mike Riversdale for MC’ing it with such pure awesomeness, Ian, Mario and Ken from Massey University for helping everyone to bring their ideas physically to life, and to the other mentors for supporting and helping the participants. Watch this space to see what happens next with Aqualitics “fish-al recognition” system. If you want to know more about the event, visit https://www.agtechhackathon.co.nz/. All concepts created during the Hackathon are the IP of the participants.